That was President George Washington’s warning to General Arthur St. Clair as he authorized a punitive strike against a native confederacy that was threatening settlement of the Old Northwest and disrupting traffic on the Ohio River — with a gruesome death toll among the flatboats descending the river for trade and settlement. Pushed out of their Kentucky hunting lands and away from the Ohio River line, the Shawnees led by Blue Jacket formed a coalition with the Miami chief Little Turtle to resist further incursions into the Northwest Territories. In 1791, President Washington entrusted St. Clair, Governor of the Northwest Territory, with essentially the entire U.S. Army to break the coalition. Big mistake. The result was one of the epic failures of arms in the history of frontier warfare. It wasn’t all St. Clair’s fault. St. Clair set off into western Ohio with a small core of reasonably competent Regulars, a bunch of half-trained (at best) militia, and a long logistical tail of camp followers composed of sutlers, laundresses, soldiers’ families and whores, all of whom moved slowly and consumed already scarce supplies. The commander also mishandled his Chickasaw scouts, whom he didn’t trust, so he lacked good intelligence of the enemy’s movements and dispositions. On November 3, St. Clair’s army went into camp along the Wabash River, on low, wooded ground under a light snowfall. The next morning, Blue Jacket’s Shawnees and warriors of the Miami, Ottawa, Delaware, Potawatomi and other nations attacked the camp at breakfast. For the confederated tribes, the battle was a tactical masterpiece. Native marksmen targeted officers and artillerymen, disrupting command structure and disabling a potentially potent weapon. When the Regulars formed up for a bayonet charge, the warriors faded back, then coalesced around the exposed unit and destroyed it. The Regulars tried to rally, but to no avail. The “battle” was a slaughter. 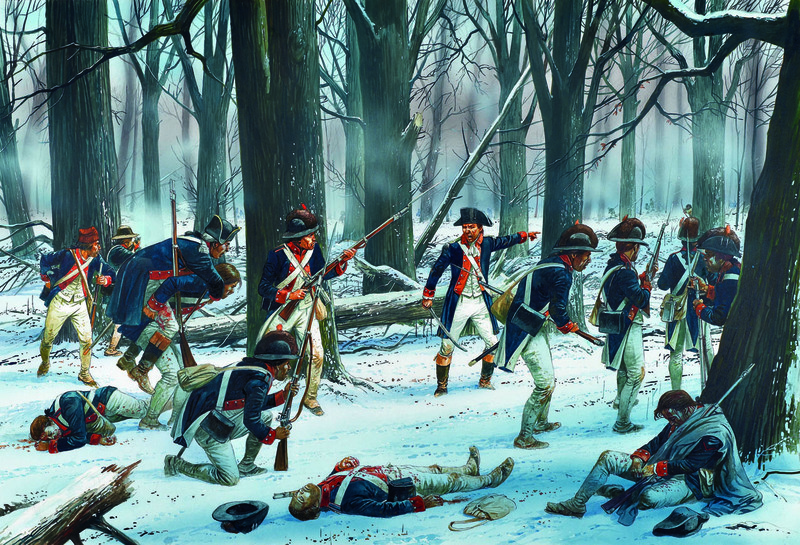 With tactical surprise and leadership disruption taking their toll, St. Clair’s force of 2,000 broke and ran. The Indians got amongst the camp followers, killing more than 600 soldiers and non-combatants and wounding some 300 more. It was the worst defeat suffered by an American force up to the Civil War. In terms of loss-to-strength proportions, it probably ranks as the worst defeat in U.S. history. Unlike Varus, whose legions were destroyed in the Teutoburg Forest, St. Clair did not fall on his sword. In fact, he defended his reputation in the first Congressional investigation of the fledgling U.S. Government. Congress exonerated him — sort of — laying blame for the disaster at the feet of the War Department and the quartermaster service. George Washington may well have felt like Caesar Augustus banging his head against a marble pillar and crying “Give me back my legions!” but the first president was too reserved and dignified for such displays. And American generals don’t commit suicide when they fail. St. Clair resigned his commission and returned to his post as territorial governor. Blue Jacket and Little Turtle had a mighty victory to celebrate. It would, however, prove illusory. Less than three years later, General “Mad” Anthony Wayne would defeat the tribes of the Northwest at the Battle of Fallen Timbers, crushing the native resistance. It would flare again, briefly, in the War of 1812, but for all intents and purposes, the battle for America’s heartland was over. WHAT an epic, period film this battle would make! So many done with Little Bighorn as the subject–this battle made Little Bighorn look like a little league game! Excellent piece on a lmost entirely neglected episode in our history. Only, it was worse in one respect: St.Clair’s Army had started out with roughly 2,000 men when he first mustered them at Fort Washington, but supply problems had caused repeated delays, and in the interim, desertion and illness had reduced his strength to just 1,486 officers and men. Moving slowly up the Miami Valley, stopping to build and garrison two forts that were 23 miles (Ft.Hamilton) and 67 miles (Ft.Jefferson) north of their base on the Ohio, St. Clair’s Army numbered no more than 920 men and a little more than 200 camp followers by 03 NOV 1791. And of course, we all know what happened at dawn on 04 NOV. No more than six officers and 18 enlisted men came out of that slaughter unscathed. Horrific in the extreme. Only horrific if your a newly minted ‘american” citizen, and your generals, and soldiers are not “worth a continental”, and your a president who sees a disaster looking as the “generals’ cannot obey his orders, or put together, the arms, supplies, and trained troops, but worry about their political futures! The indian tribes, unite, and provide a force of WARRORS!!!! !, with the Western Confederacy quickly adding numbers to the warriors of Blue jacket, and Little Turtle. Chief Buckongahelas led his 480 men to join the 700 warriors of Little Turtle and Blue Jacket, true warriors, and chiefs of experience, and intelligence, not just cunning. 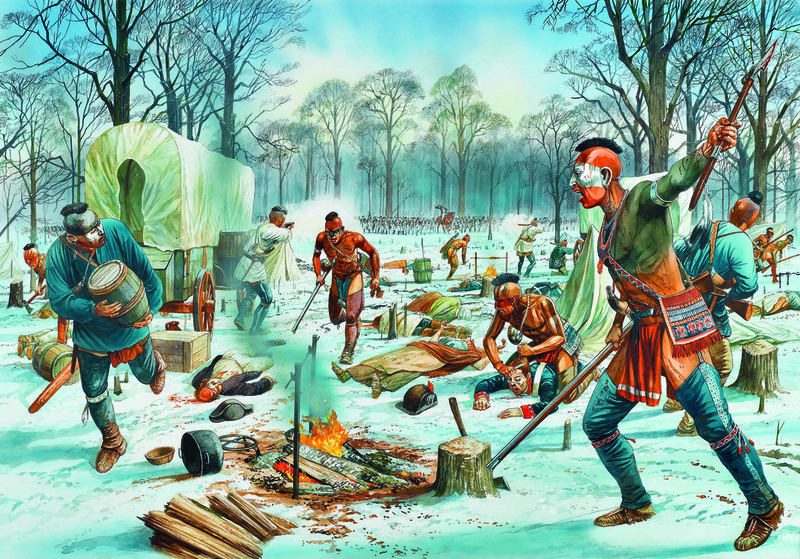 They bringing the war party to more than one thousand warriors, including a large number of Potawatomis from eastern Michigan and the Saint Joseph. True warriors, and real soldiers with discipline, and fighting spirit, not just bloody savages who wanted victory, and knew how to fight! After three hours of fighting, St. Clair called together the remaining officers and, faced with total annihilation, decided to attempt one last bayonet charge to get through the Indian line and escape. What a fool, as Little Turtle, and his warriors, expected this,and smiled at the white fools. Supplies and wounded were left in camp. As before, Little Turtle’s Army allowed the bayonets to pass through, but this time the men ran for Fort Jefferson. They were pursued by Indians for about three miles before the latter broke off pursuit and returned to loot the camp, and collect the scalps of these fools, and their officers. Exact numbers of wounded are not known, but it has been reported that execution fires burned for several days afterward. Yes the victors were savage, and bloody in their habits, of looting , scalping, torturing, and mutilating, but they earned the victory, and honored their tribal cultures. 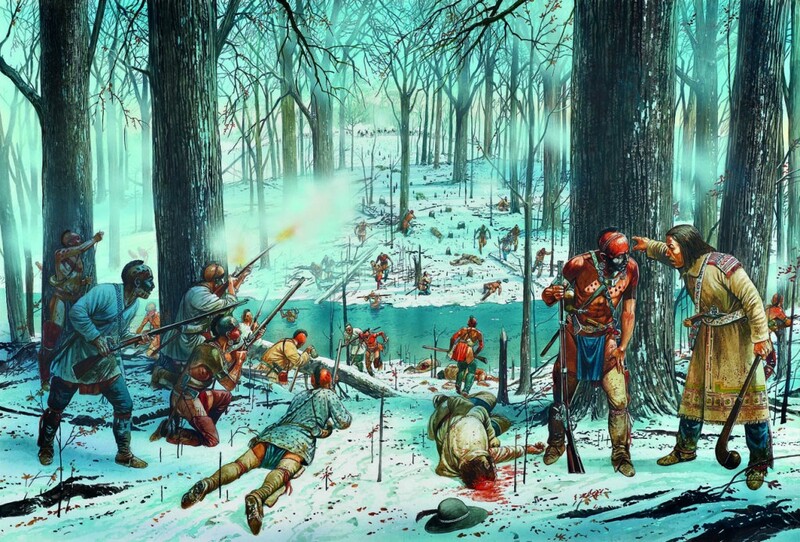 I am proud that my grandfather traced my families roots back to the the Miami-Illinois tribe, and can only hope that i carry some of the dna/”blood” of these proud victorious warriors, and yes i’d join in the fighting, and the savage celebrations of victory that were their habits, and culture after such a hard fought victory! Would these “americans” have been less bloody and savage if they had been victors? i doubt it. [see the ‘https://en.wikipedia.org/wiki/St._Clair%27s_Defeat’ for details. Enjoyed reading that, Allen. Thanks for stopping by the campfire. Looking for descendants of Lt. Col. William Oldham. My great great great grandfather, William Ellit, was one of the three hundred men that made up the 1791 Kentucky corn stock militia. The Kentucky militia was commanded by Lt. Col. William Oldham. On November 3rd, 1791 the Kentucky militia met up with General Arthur St. Claire and the US Army along the Wabash River in Ohio. The next morning Chief Little Turtle and his army of Miami braves, and many other tribes, crossed the Wabash and started the battle of Wabash. First battling the Kentucky militia and then the rest of the Army. Lt. Col. William Oldham lost his life in this battle. From my family oral communications that has been past down thru the generations, my ggg grandfather William Ellit and another Kentucky frontiersman left the battle scene to go get help. 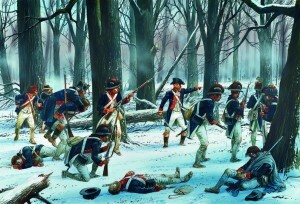 It was known that Major Hamtramck and his battalion was camped about 9 miles south of General St. Claire’s camp. On foot they both were able to sneak out from the battle and ran in the direction of the reinforcements. Contact was made and Major Hamtramck was advised that the Miami Indians had General Arthur St. Claire and the State Militia’s surrounded and was killing them off. Major Hamtramck sent a small group to the battle scene to get a better assessment of the battle and turned the rest of the battalion around and responded to Fort Jefferson, a small fort and not completed yet, and he perceived that Chief Little Turtle would make that the next target. Why I am reaching out to any Oldham descendants. This family story is just a story without evidence. I have not been able to find a complete list of the men who marched out of Kentucky with Lt. Col. William Oldham, nor have I found a list of the survivors that returned to Kentucky with Captain John Thomas of the Kentucky militia. I have searched military files and have found partial list of names. I have contacted the State of Kentucky with no results. I have contacted the State of Kentucky military records with no results. Then I thought just maybe an Oldham family member might have the muster files and maybe the survival list of names that returned to Kentucky after the battle. I have lots of circumstanial evidence of my William Ellit was with the Kentucky militia i.e. : family oral communications and old letters, William Ellit was neighbors to Captain John Thomas in Hardin County, Kentucky, etc. If any family member has access or copies of these list I would be forever greatful. Would love a copy of both files to verify that my William was with your William during the battle of Wabash. ps My William Ellit’s 10th son is related to Lt. Col.. William Oldham through marriage. That is some serious Frontier Partisan heritage. That’s some serious family history there. My ggg-grandfather, Captain William Faulkner, commanded company of riflemen from Pennsylvania Militia. His unit anchored right flank during battle. Winthrop Sargent, who wrote of event, stated that unit performed well. Faulkner was commissioned captain in Wayne’s Legion in 1792. That’s some serious Frontier Partisan heritage there. My historical fiction novels, An Army Lost and The Hostages, start with the Battle of the Wabash and continues with the ramifications. The third book (about 3/4 done) continues to The Fallen Timbers. I was invited to speak at the 225 Anniversary of the battle last November 2016 and met quite a few ancestors of those who fought. Outstanding! I will check these out. Thank you for stopping by the campfire. My ancestor, Abraham Piatt was killed in this battle. He was a Captain at the time and is said to have been wounded and told his men to continue to retreat while he provided covering fire. I do not know how accurate that story is. Does anyone out there have anything to corroborate that version? My 5th Great Grandfather Benjamin Price (Maryland) was in St. Clair’s Defeat, War of the Wabash. I think there may be some confusion about the Benjamin Price in the trees in Ancestry, which indicate he was killed in St. Clair’s Defeat. I’m trying to verify, my 5th Great Grandfather Benjamin Price (Maryland) if he was killed or wounded in St. Clair’s Defeat. According to the U.S. Returns of Killed and Wounded in Battles, 1790-1844, listed was a Capt. William Price (Kentucky Militia) and a Lieut. Benjamin Price (Maryland Battalion). A Dictionary of all Officers who have been commissioned, in the Army of the United States*, has listed a Capt. Benjamin Price (Kentucky) and Lieut. Benjamin Price (Maryland). The above documents were accessed through Ancestry.com. Documented in the American State Papers – Indian Affairs, Vol. 1, Page 138, there is a list of killed and wounded, last names only (one Price Listed as killed and one Price listed as wounded) and does not state what militia or battalion they were with. *Lieut. Benjamin Price (Maryland Battalion) He was Lieut. of his company in Maj. Henry Gaither’s Battalion, ‘levies of 1791’; wounded in battle under Maj. Gen. St. Clair, with Miami Indians 4 Nov. 1791; Lieut. Infantry. 16 Mar. 1792; Capt. 4 sub-legion rank from June 1792; Paymaster Oct. 1792; ‘out’ in 1796. If someone may know about a William or Benjamin Price in the Kentucky Militia at the time of St. Clair’s Defeat, I’m reaching out for some help. This will help me to verify my ancestor Benjamin Price of Maryland, if he was wounded or killed.